FoodChallenges.com > Food Challenges 101 > Are Food Challenges Wasteful? Before writing anything else, I must confess that I have been kicked out of a bar for grabbing food off a stranger’s plate who was going to waste it. Stereotypes exist for most groups of people, but of all misconceptions about competitive eating, calling us wasteful is the most ignorant and offensive. I have worked in the kitchen at multiple restaurants, and I have also worked at a banquet hall. Over the years I have been to many parties where food was served, and I have also been out to eat with many different people. It would be incorrect on any set of standards to say that I do not personally love food. I can confidently tell you that true food challengers and competitive eaters are some of the least wasteful people in the world today. I am not exactly normal, and therefore cannot be used as a case study, but I always make sure to avoid wasting food, and I will put forth additional effort to make sure waste is prevented. When I was in 5th and 6th grade, with the help of my mom and the Weight Watchers program, I lost over 40lbs. During that time, I learned about the weight-loss theory “Which waste (or waist) do you want the food to go to?” People are taught to think about that question before eating food they know will not help reach their personal weigth loss goals. In today’s world, sadly, there are many people that will let the food go to waste, but I personally would choose letting the food go to my waist, and then working out more and eating less the next day to burn the calories. At a party where dinner is served, where are you most likely going to find the competitive food eater? While everyone else is back to watching TV, playing games, swimming, and interacting, he or she will still be eating seconds and thirds, followed by dessert. I am asked to “finish the last few bites” of a dish all the time because the remaining portion is not really worth saving. 100% of the time, I say yes and I finish it off so that it does not get wasted. I love buffalo chicken related foods, pizza, Mexican food, and all desserts, but my favorite food is cold leftovers that other people couldn’t finish, because I never have leftovers myself. Even on a first dinner date with a girl, I am not afraid to finish off any food she can’t finish. One time years ago I was out to eat with four girls for somebody’s birthday, and I didn’t even really order a full meal because I knew I would be offered the leftovers from at least one of them. I ended up finishing something from each of them, all food that would have been wasted otherwise. Throughout my years in the restaurant business, I watched hundreds of pounds of food get thrown out due to policies put in place by our country’s health department. During my year working at a banquet hall, I watched hundreds of perfectly good “plated dinners” be thrown out because certain individuals did not like the food chosen. Food challenges and competitive eating are not even close to being considered a real contributor to the world hunger problem, and therefore people need to stop using them as a scapegoat. Feel free to check out the photo used for this article above. 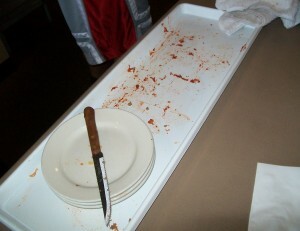 That is what my plate looked like after finishing a 5lb meatball sandwich challenge, and it looks similar to my plate after every other challenge I have beaten. There have been challenges that I did not finish, but I took the leftovers home and ate them the next day, just like many people do that cannot finish their normal meal. Just because food challenge meals are larger, that doesn’t mean that more food is wasted, and all possible correlations make no logical sense. If a restaurant is hosting an eating contest and happens to misjudge how much food was needed for the event, there may be a little more food wasted than normal, but typically spectators are allowed to sample and eat the untouched food leftover after eating competitions, and therefore hopefully the food is not wasted if people come and eat the remaining leftovers. In the PROMOTERS section, I offer the article How To Reduce The Waste Of Challenge Food so that restaurants are able to minimize the amount of food wasted at the restaurant due to the food challenge. If both the restaurant and the eaters taking the challenge take the initiative and make sure food is not unnecessarily wasted, the food challenge will be the least wasteful item on the restaurant’s menu!! I am not going to get into the cause of world hunger or discuss issues with current government issued health policies imposed on restaurants, because all of that would just be an opinion. It is a fact that true food challengers and competitive eaters are some of the least wasteful people in the world today. The purpose of a food challenge is to finish the entire meal within the required time limit. Nobody has ever started a challenge wanting to lose, so therefore nobody has ever started a challenge hoping that food would get wasted. You may witness one person having a majority of the challenge remaining and letting it go to waste, but attempting one challenge does not automatically make a person worthy to be labeled a competitive eater, and therefore don’t judge the entire eating community based on one person who is not even part of it. Millions of pounds of food are wasted each year around the world, and there is nothing that you or I can do about it. All we can do to limit the amount of food wasted is to worry about ourselves and make sure that we are not wasting food unnecessarily in our own lives. A passionate competitive eater will not let cold french fries (chips) go to waste, and we don’t believe in the “Which waste (or waist) do you want the food to go to?” theory. We will chose “waist” almost every time. Before you ignorantly “throw the first stone,” and make a comment about us being wasteful, make sure you don’t waste either. Either way, expect to be offended by our feedback supporting why you are wrong. Thanks for reading “Are Food Challenges Wasteful?” and thanks for checking out FoodChallenges.com! !